Putting butter in coffee appears to be the latest craze across the web and there are a huge number of fans who enthusiastically promote its benefits and recommend it to anyone who will listen. It sounds pretty rich, but does it really have the health benefits that it’s purported to have? And where precisely did this strange idea come from? The idea of putting butter into coffee actually started over at the ‘Bulletproof Executive’ blog run by Dave Asprey. Asprey is a popular productivity/lifestyle blogger in the vein of Tim Ferriss, who discusses various ways to ‘hack’ your body in order to increase health, productivity, creativity and the like. The ‘Bulletproof coffee’ proved to be perhaps his most popular hack, which was a recipe for preparing coffee that he claimed could increase productivity, aid concentration, increase the half-life of the caffeine, remove the unpleasant ‘jitteriness’ associated with coffee and at the same time control appetite to help stave off snacking and hunger pangs. Dave also believes that we generally don’t get enough saturated fat in our diet and that this makes the coffee a very nutritious option. It’s even supposed to burn fat. The butter and MCT oil should first be blended with the coffee to make it creamy, before filtering and pouring into your chosen vesicle. The upgraded coffee that Dave sells is apparently free of ‘toxins’ that he says are responsible for the feeling of jitteriness you can get from coffee and for the crash that sometimes comes once its effects have worn off. It doesn’t go cheap though, and a lot of people will use the same recipe but with ‘regular’ unbranded coffee. So what’s the reasoning behind this strange way of drinking coffee? How is it supposed to give you all these benefits? The idea behind the specially prepared coffee as mentioned is that it can help to get rid of ‘toxins’. Likewise using organic, grass-fed butter ensures you get the most antioxidants and avoid toxins at the same time. The butter on the other hand is intended to add saturated fat, which until recently might have seemed like a bad idea. Recently though, studies have demonstrated that saturated fat has been unfairly demonised (1, 2, 3). Saturated fat is now known not to cause high cholesterol and to be much less destructive when it comes to weight loss than simple carbs and sugar. One of the big benefits of saturated fat is that it takes a long time to digest, which means that it sits in the stomach and helps to keep us feeling fuller for longer. Meanwhile this also means that we get a steady supply of energy and avoid the sudden ‘spike and trough’ associated with sugar and the insulin response. This slower digestion could also potentially mitigate the impact of the caffeine thus drawing out its effect. Finally, MCT oil is a specific type of fat that doesn’t get used by the body in the usual way and instead heads straight to the liver to encourage the production of ketones. Ketones are a source of energy for the body in a similar manner to glucose, but are particularly effective at supporting certain functions within the brain and may be less likely to ‘burn out’ neurons in the same way that sugar potentially can. MCT is provides a very rapid source of energy in this way as well, and is also said to increase the metabolism for fat burning properties. The question though, is whether the reality lives up to the hype. Can bulletproof coffee really do all those things? Or is it just another example of snake oil? The answer isn’t that straight forward but there are certainly good and bad aspects of bulletproof coffee. On the one hand, the idea that coffee contains toxins that can hamper your performance isn’t backed up by any science and is more than likely just a marketing gimmick. Alan Aragon is a well-known bodybuilding nutritionist and describes ‘Upgraded’ coffee as inventing a problem that never existed in order to sell coffee. The same can be said for the insistence on using only grass-fed butter. Is there a difference between grass-fed butter and regular butter? Yes: the nutrition of the cow does minorly impact the quality of the milk (just the same as a Mother has to be careful about her diet) and thus grass-fed butter is slightly more nutritious. But is this going to have any acute effect on your energy or focus immediately after drinking coffee? Not likely. There are plenty of other places you can get your antioxidants and hunting down expensive butter is not the most effective way to be spending your time. Coconut oil on the other hand is great. It genuinely will increase your energy levels and it’s very good in general for supporting health and aiding in weight loss. It is true indeed that saturated fat doesn’t lead to the same sugar spike and thus ‘lipogenesis’ (fat storage) that simple carbs do. It’s also true that saturated fat will keep you feeling fuller for longer. But what that doesn’t mean is that there is no way whatsoever that eating saturated fat can lead to weight gain. It’s still calories, and excess calories will still get stored as fat if you don’t use them. At the same time, most people are likely to eat some form of carbs around the same time they get their coffee anyway. So just how many calories on average are in a Bulletproof coffee? About 440. Which is an awful lot of calories from a drink. Enough to certainly undo the benefits of an hour of exercise in fact. The thing is that Bulletproof coffee is often recommended as a meal replacement. Specifically it’s suggested as an alternative to breakfast. Wake up, drink your Bulletproof coffee, then head to work feeling full. This way you get the same number of calories you might normally get in the morning, but from saturated fats rather than from carbs. But while saturated fats are good, butter alone is not nearly as nutritious as a balanced breakfast such as whole grain cereal, fruit or even a fry-up. Bulletproof coffee contains 51 grams of fat, no carbs and barely any protein. So if you normally eat a full, normal breakfast each morning, then switching to this ‘Bulletproof diet’ will mean you’re actually get only a third of the nutrition you were previously. Even the MCT oil is a little like coconut oil without the nutrition – you’re better off with normal coconut oil for this one. There are other healthier ways to get similar effects. My breakfast for instance consists of oatmeal followed by 2-3 eggs. This provides me with slow-release energy high in nutrients (as oatmeal is a whole grain) and it also gives me all the protein (essential amino acids) I could need and a good helping of saturated fat. Protein has also been shown to be highly satiating and to increase the metabolism (especially eggs). Regardless of the nutritious benefits of Bulletproof coffee, it’s unlikely you’re going to want to stick to it if it tastes terrible. So what’s it like? The butter does indeed make this a very creamy drink which is nice for the most part, but at the same time it’s not quite as effective as milk when it comes to diluting the coffee. In other words, it tends to feel as though you’re drinking a very strong black coffee. And it doesn’t look very appealing as fat isn’t water soluble – translation: spots of oil floating on top of your murky brown coffee. More worrying is that many people will feel a little sick drinking Bulletproof coffee as it really is so rich. The recommendation is to reduce the amount of butter and MCT oil if you experience those effects, but really it should be taken as a warning sign if your ‘health drink’ is making you feel physically ill. So what’s the conclusion? Well I’d say there are lessons to be learned from Bulletproof coffee. It shows us that coconut oil is miraculous and that we aren’t getting enough saturated fat. Avoiding spiking our blood sugar is also highly useful for aiding weight loss. That said though, throwing tablespoons of butter into our coffee and skipping breakfast is going a little too far and isn’t really practical. I would be very hesitant to take advice from this article. The author does not seem to know that grains and gluten are detrimental to your health. They cause leaky gut & leaky brain which leads to cancer, Alzheimer's, diabetes, & heart attack. Also unpasteurized dairy products are horrible for your health. Where are your scientific studies to back up your claims? Excellent article on what "health" trends NOT to follow. I also learned I am totally ignorant about coconut oil and have some research to do there. I also learned that eating oatmeal or eggs like I do is good, but eating them at the same time is better! Thank you for the common sense, concise education I've been looking for for years! Key element to making bulletproof coffee is in mixing it properly. Meaning there are no spots of oil floating anywhere. The properly mixed BP coffee turns into a nice, homogenous, well emulsified, creamy cup of goodness that looks very much like a latte and even sports a nice bit of foam. A small high speed blender/smoothie maker helps (search for Epica Personal Blender on amazon for a well suited option). Butter is nothing other than concentrated whipping cream with excess water and milk solids removed. 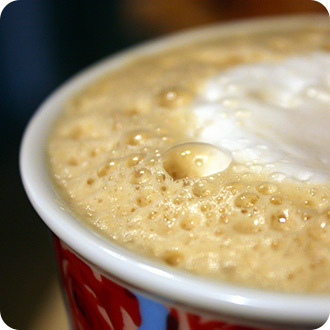 Hence, a well-made BP Coffee will taste like a coffee made with cream whipped to perfection. The coffee taste can be diluted by the amount of butter added, but not that much is needed really, 1 tbsp will make a nice creamy mix. A standard addition is collagen (no taste and heat resistant), or even to blend in some raw eggs (has to be done while the mix is blending, doesn't work so well with the blender recommended above, but would work great with a vitamix) to have a full and filling meal. In addition, the BP Coffee is part of a whole concept. One would also not advocate that a meal consisting of oats and eggs was an ideal standard meal if it were not part of a full nutritional plan. I recommend spending a few minutes in the bulletproof website, YouTube, or getting the book for better info than is provided here. Then test it *properly* and decide. There is a reason why so many people are sold on it. Obviously I am (and therefore somewhat biased). It made me change from being a life-long non-coffee drinker to having this as my standard morning brew during the week (almost two years now). No caffeine on the weekends… But the ketone boost can still be had without the caffeine kick. Educate yourself. Play with it. It is worth it.